SRING RETREAT – WISDOM OF THE SPIRITUAL HEART – MAY 18TH, 19TH, & 20TH, 2018 … CARPINTERIA, CA. The journey of the Spiritual Heart is a constant awakening in this Human experience. We are here playing in the field of illusion that we have participated in creating. Nothing that crosses our path can terminate the Spiritual Heart that we are and are of. We may not know this when we are in challenge times. These challenge times are the very things that gift us with a choice to awaken or separate once again. Every day, every Breath we have an opportunity to reside, relax into our Spiritual Heart. When we are in our sense of separation in the many ways this can occur, we are called to be the love, the light alchemist to the part of us that is in distress. When we do this in Spirit we change the Inner Reality which spills into creation. We are one and we have the choice and power to awaken through the Spiritual Heart while here in this negative, magnetic reality. We are pulled to separation here and to be a powerful Lover we must open to the unconditional Love that resides in all things. Join a small group of Loving Hearts and explore, awaken the Spirit with-in. Love is Breathing you. Let this awaken you in ways that you have yet to tap into. Wisdom of the Heart will support and guide you in your day to day life. you must take the time and go with-in to know this, to awaken to this. RETREAT – May 18th, 19th, & 20th – Spring Retreat – WISDOM OF THE SPIRITUAL HEART, CARPINTERIA, CA. You Are Inspiration of Love – Workshop Date and Time – January 8th , 2018 ~ 6:30pm to 10:30pm ~ This is the 2nd in a series of 3 to start the New Year and the replacement for the canceled workshop in December due to the fire. This workshop will continue the process of Polishing while building a foundation in flow of your Inner Inspiration your Inner Glow – Being an inspired Life. We are the inspiration of Loving creation. We know this yet, do not know this. Once again take the opportunity to awaken the places that are sleeping in the negativity to the Love that is present now. This overflows into all that is here in our world, as we are the Loving Inspiration of the Beloved, we are One in this creation. January 1st will open the places that are sleeping while lifting in Light Love, this is what waits for you in those places. January 8th will bring more Light into what is calling you, bringing more connection in an authentic stream of Loving inspiration, manifesting a clearer view of your Blue Print. This Blue Print is about you being the Love from with-in. Knowing the Divine is Now and how this is in every aspect of creation, therefore being a co-creator in awareness. The 3rd in the series will anchor a flow that you have been Blue Printing. We are all in process at all times, so do not worry about grabbing anything, be open to the unfolding in design. Be open to being met as you Inspire in the light that you are. Come share in the light, opening our hearts and lives to more love. Freedom through love with spirit in our inner worlds brings peace and understanding. This opens our lives to more love and light in all ways. The answer is love within. Our own dialogue and creations are waiting to be touched in the light and loved back to the true knowing of home in God of God as one. We are the Beloved singing our love song back home to the Beloved. This is here and now, we do not have to wait to know we are Love, we are free in Love, We are the Beloved of the Beloved. We are one. Be the Love…We will align in the light with meditation and light work (processing) bringing the love forward where it has laid quietly waiting. There will be beach walks and journal writing. Please bring your journal and any drawing / writing accessories you like. Bring comfortable clothes and layers as the temperature can vary. 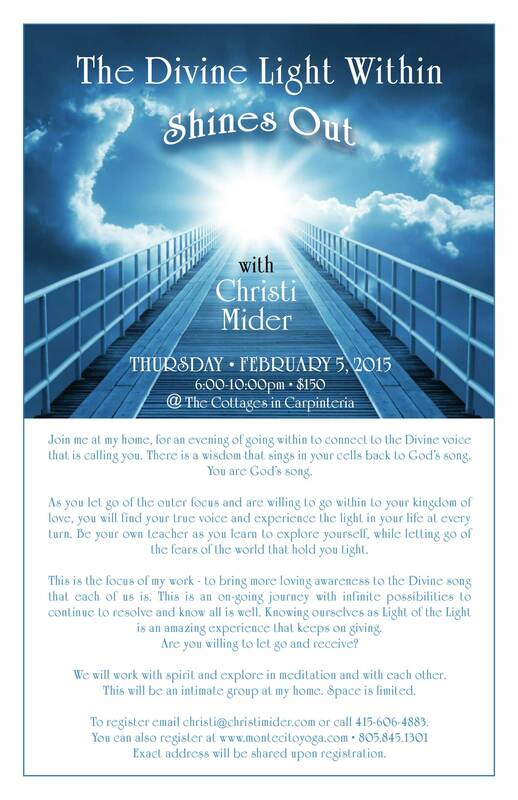 I am once again excited to hold and house our retreat at The Cottages in Carpinteria California, where we can all be together holding the light. Staying at the cottages for the weekend is encouraged but not a must. Residing at the cottages, allows you to step away from your day to day patterns, giving yourself completely over to the loving support offered in the retreat atmosphere. If you are unable to retreat at the cottages, you are still welcome to take part in this light filled weekend. This is a beautifaul, playful cluster of bungalows located in the small town of Carpinteria, California just a few miles south of Santa Barbara and few blocks from the beach. REGISTER & Tuition Payment Call: christi @ 415-606-4883 or email: christi@christimider.com~~You may mail tuition address 4861 7th Street, Carpinteria, Ca. 93013 or Call Christi with credit card. You have heard this, read this but, what is you? You are the Divine essence of God. This love song of God hums through you, sometimes it is heard and known profoundly and other times seems to not exist. It is impossible for this love song to be silenced but, when you turn your focus to the world outside to hear and know this, it will seem silent or even off tune. You must learn to attune to your own inner worlds of God to be aware and walking in the light, humming the song of love you are in every step. Letting go of the mind and emotional chatter of pain, suffering and separation, through healing love, allows this love song to sing you through your life. We will clear the way for your creative channels to come into atonement, alignment to the freedom of the life of joy and abundance in love creation. Join me in a 2 day workshop, attuning to the loving spirit you are and you are of. When we gather with others to attune to the light love, we create a sacred space for healing and upliftment. Come explore the ways that you with-hold your own knowing of God within, and open the gates of love that you have been holding closed as protection or false identity. We explore through meditation and processing. Sharing the light action of love, joy, and healing, bringing harmony back into the cells of our very creation. We know our song of love as we attune ourselves in the light. Walk in this world singing your light love song, your God song. It is here now.. Registration: Please pre-register including tuition, this allows anchoring of the class in support of all attending and organizing. Tuition $600.00 due at registration. Tuition is non refundable. CLICK ON image ABOVE to REGISTER online at MontecitoYoga or call 805.845.1301! CLICK ON image ABOVE to SIGN-UP for event at MoYo online! Click on image above to register online. Click above to sign-up online!